Put the power of Excel formulas and functions to work for you!Excel is a complex program. Mastering the use of formulas and functions lets you use Excel to compute useful day-to-day information, such as calculating the true cost of credit card purchases or comparing 15-year and 30-year mortgage costs. This fun and friendly book demystifies Excel's built-in functions so you can put them to work. You'll find step-by-step instructions on 150 of Excel's most useful functions, how they work within formulas, and how to use them to make your life easier. 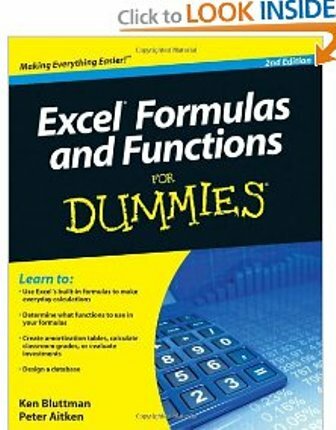 In the ever-popular, non-threatening For Dummies style, Excel Formulas and Functions For Dummies, 2nd Edition makes Excel's power accessible to you. Get your hands dirty and dig for the nuggets in your data! This book shows you how, walking you through over 150 built-in functions in Excel 2010. Want to calculate a loan payment? How about finding a trend in your data? It's all covered with step-by-step instructions and illustrations, so you can put the power of Excel functions to work.